The war is going on next level. It will to be more cruel and meaner. 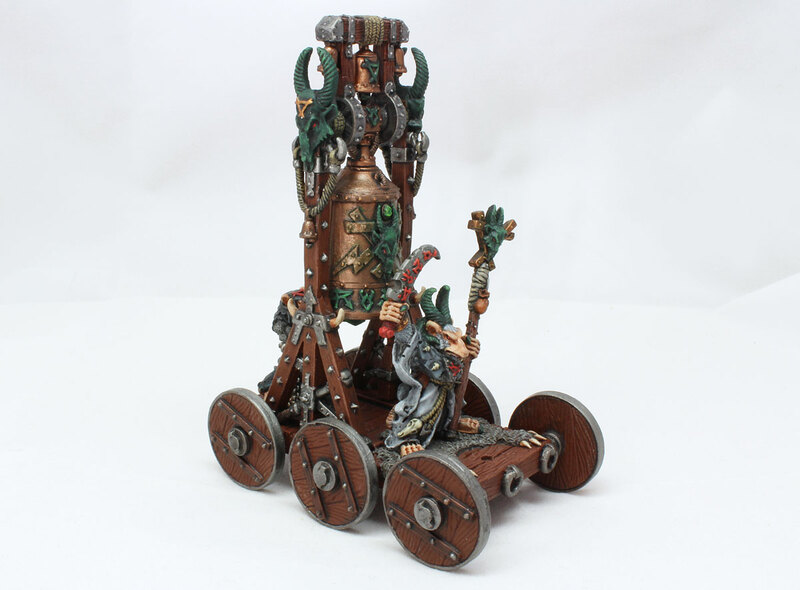 My Skaven will start wining from now on, marching proudly in the echoing rhythm of The Bell. Screaming Bell (wishful thinking, I know:). Finally, I managed to finish this awesome model. I started it quite some time ago – I think it was around 3 or 4 months ago. I have small problem with war machines. I got easily bored with painting wide wooden or metal surfaces. I prefer to paint small detailed miniatures. So, this Screaming Bell was painted in few stages. All interrupted by some other miniatures, I was particularly fond to paint at the moment. I think I painted during that time around 10 models or so. OK. But the day has come, last week. I think it was Friday. And I said to myself – My God, I could paint The Bell for ages if this will continue. So I’ve pulled myself together and I’ve finished The Screaming Bell in one go. Until end of the day I could feast my eyes with this awesome model. The model is 4/5th edition metal Screaming Bell from 1992. Simple – comparing to the current plastic version. Not so sophisticated and dynamic, but still great. On the front – obviously Grey Seer, on the back The Striker. 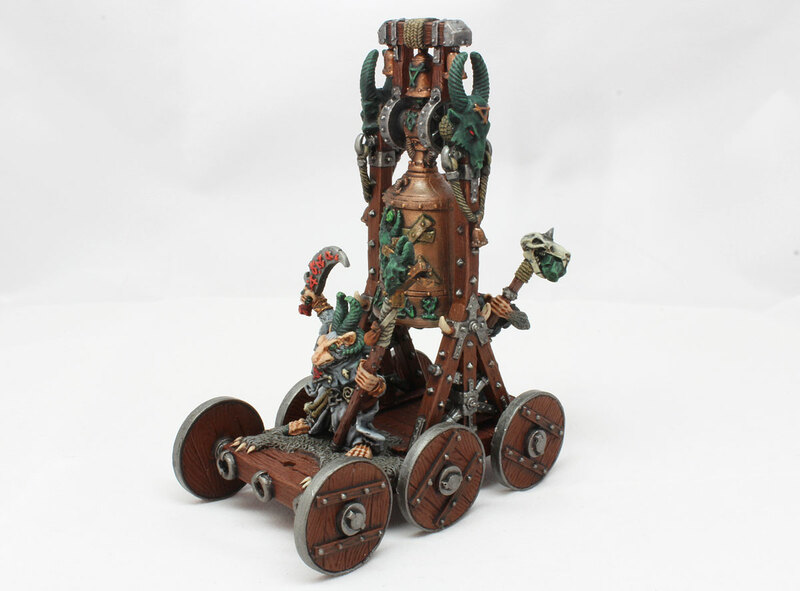 Right now in 8th edition of WHFB and in Age of Sigmar – big angry Rat Ogre is ringing the bell, but in4/5th edition – the role of ringing the Bell was given to The Striker – Skaven with huge magical Warpstone two handed hammer. The rules did not change a lot during all those years. Basicly idea remained the same – Bell is pushed by regiment by regiment of Clanrats or Stormvermin. 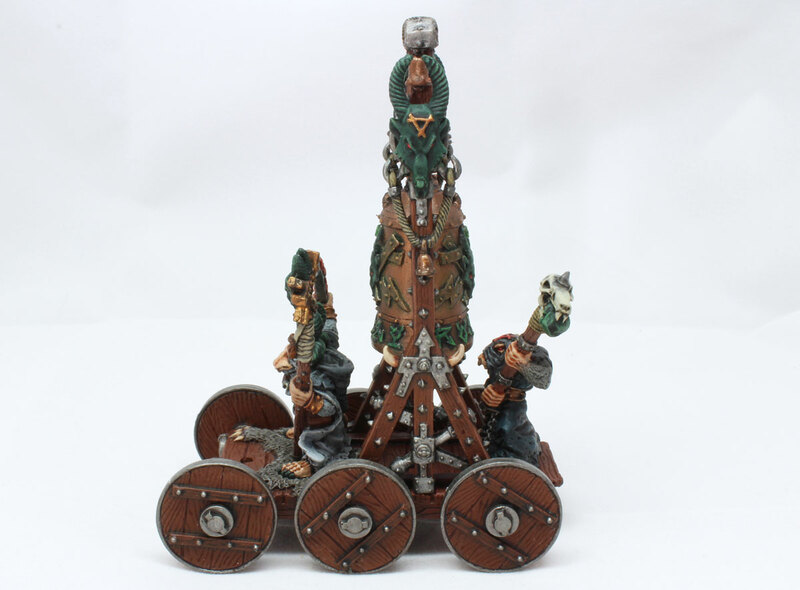 Grey Seer is proudly ride the platform and all you have to do is get to the enemy ad ring the bell to get some fascinating effects like additional movement or destroying buildings and war machines. Even in Age of Sigmar where there are blocks of regiments seized to exist – idea is still similar. And now, around 15 years later I re-bought The Bell I painted it the best I could. Still I don’t like to paint war machines, but my approach to painting thankfully changed. I painted in little bit different colour scheme than typical Oldhammer machines (you know – colours were so bright that your eyes hurt so much). Old Screaming Bell was black and red. And Grey Seer had so fancy colourful clothes – that you can assume that they were bough in most sophisticated wizard robes boutique in whole Skavenblight. Sorry, but I refuse to paint models like that. I know, it has some old school appeal, but I prefer more realistic way of panting miniatures. So, as you can see – it’s all wooden, with metal/copper fitting. Almost all gems and decoration are painted as they were made from Warpstone. And my Warpstone is very dark green with some lighter green flash. Base: Caliban Green and toning up into Warboss Green and Warpstone Glow. Grey Seer and The Striker are wearing more moderate clothes – definitely not old school. My Grey Seers have obviously grey robes (different shades), almost white fur and green horns (if Grey Seers are overusing Warpstone powders – their horns grow green. Simple as that. At least for me:). As you probably noticed – one part is missing. There is small hole in front of Grey Seer. This is the place for pot full of Warpstone tokens. Unfortunately I lost it somewhere. I still believe I’ll find it and put it the right spot, so I left it without manufacturing any replacement or filling the hole with green stuff. This Screaming Bell is prepared especially for the battle against The Empire I’m finally going to play this Friday. The game will be played with old 5th edition WHFB rules, so I decided to paint this old model instead of new plastic version. I can’t wait for this battle – I’ll be ringing as crazy every turn. oh, joy what a pleasant game it will be:). Plans for the future: As most of my collection is packed and left on the attic of my mother’s house, I only have handful of models left at my place. Few models to Infinity, Wolsung and Malifaux. No more Skaven:) Next: I need to finish Waldgeists (just few final touches) and I can proceed with already assembled and primed Niphilims. So this week will “Malifaux: week! Yay, can’t wait! 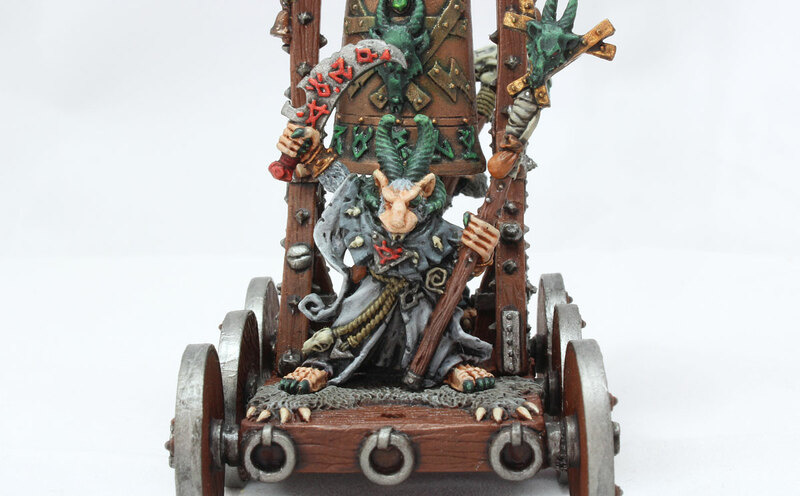 Awesome – I love the oldschool warmachines, and I love how you painted this up mate. Nice job and good luck for Friday! !